(Newser) – Al-Qaeda may be on its last legs in the Middle East, Afghanistan, and Pakistan, but the extremist group is doing better than ever in Africa, growing steadily since 2006—thanks to good community relations and steady handouts of cash, candy, medical aid, and other necessities, reports the AP. Al-Qaeda in the Islamic Maghreb, or AQIM, in particular is flourishing, having raised $130 million from kidnapping at least 50 Western citizens around the region, and today has grown from its origins in Algeria to stretch across the Sahara. Al-Qaeda does not strive in the Sahara. 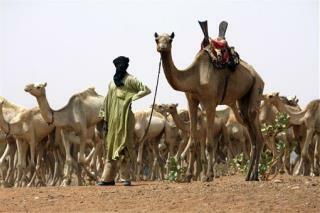 The Tuaregs have been policing the desert for decades, they hate Al-Qaeda. Algeria has been hunting them down and have been supplied with tech from the United States, even civilians in Algeria have started reporting intel. US/NATO brought in a ton of them on transport aircrafts from Afghanistan to fight green forces in Libya, Now their flag flies above the courthouse in Benghazi and their leader Belhadj has been appointed Commander of Tripoli. The Salifis looking to grab power in Egypt have ties to Al-Qaeda. Notice how the United States never actually fights Al-Qaeda, but groups that have ties to it. No probelm; now we know where to redirect our drones, our Delta and Team Six folks. Best re-read Dune, just to remember that even desert tribes can have a big impact!